Description: Short train trundles into Lesperance Yard. Title: UP 1532 cut's through the Hot Rod Powertour in downtown Springfield. Description: The only Southbound train today. 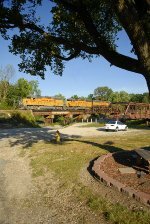 With six engines one of which was set out at Poplar Bluff. Description: The only Southbound I saw today. Description: UP 1552 ex-SP 7297, ex-Missouri-Kansas-Texas 171 on UP's YRB74-11. Description: A UP freight races by at Hustle, IL. 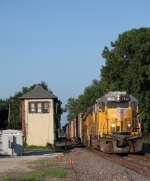 In tow are two GP40-2's, and further back are a set of flatcars with Caterpillar equipment.